Support - FarStone Technology Inc.
You can install software as a 14-day full-function evaluation versions without a license code. Product activation: If you get "Activation Failed! ... Code = 500", please click "Help" -> "Register Activate" -> "other activation options" -> click "copy to clipboard" button (refer screenshot below). 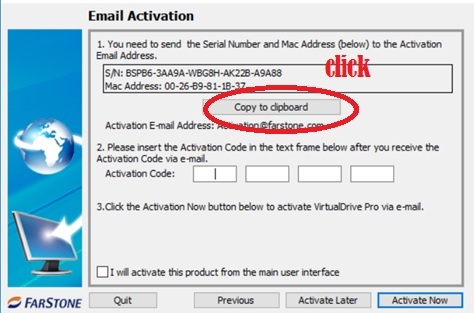 Create an email, paste (Ctrl-V) the S/N & Mac to the email and send to activation@farstone.com. You will receive an "activation code via email. Enter the activation code to activate the product.